Princess Alexandra Hospital was designated as a Magnet organisation in 2004, 2009 and 2014 by the ANCC Magnet Recognition Program®. This prestigious designation recognizes excellence in nursing services. 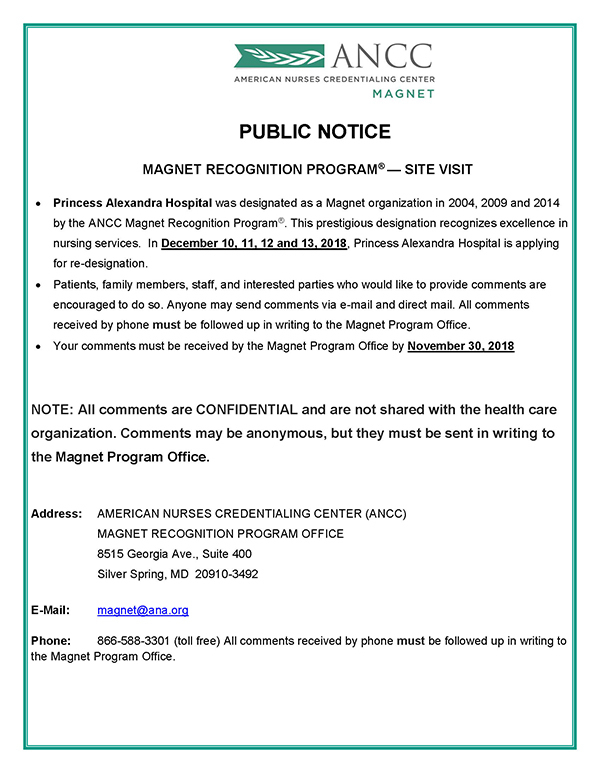 In December 2018, Princess Alexandra Hospital is applying for re-designation as a Magnet organisation. Patients, family members, staff, and interested parties who would like to comment on the process are encouraged to do so via email and direct mail to the Magnet Program Office by 30 November 2018. In 2004, the staff of Princess Alexandra Hospital were elated to be the first hospital in the Southern Hemisphere to receive the prestigious 'Magnet' designation for excellence in nursing care. In May 2009, the PAH became the first re-designated Magnet facility outside of America and in June 2014, PAH became the first health care organisation outside the United States to receive Magnet designation for the third time. Achieving Magnet Recognition ultimately recognises our 2,200 valuable nurses, the highest quality of care they deliver, the support they receive, opportunities available, the team environment, commitment and spirit that we are extremely proud of. Magnet is an international program which has three decades of evidence based research recognising the benefits of the program to both staff and patients. Magnet empowers nursing through creating a culture that values clinician participation in decision making, transparent review of work practices and support for personal and professional development with a focus on evidence based patient outcomes. The international program is transferable within all healthcare settings but only an elite 398 healthcare facilities have met the stringent criteria. Other designated Australian facilities include: Sir Charles Gairdner Hospital in Western Australia and St Vincent's Private Hospital in Sydney. If you have any further enquiries, please contact: Sandra.Moss@health.qld.gov.au.